You thought Intel was behind the 8085, so why in the world would we list an "AMD 8085?" Back in the day, computer manufacturers would insist on having several independent producers of a chip to guarantee supply. 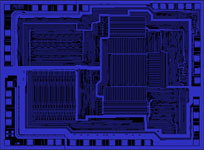 AMD was a second source producer of the 8085, having licensed the design from Intel. Can you imagine an AMD or NVIDIA Core i7 today? Things aint what they used to be. Pavel Zima has done a great job extracting components into per-layer images. 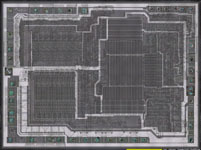 So far, we have only metal and vias, as we'll need to delayer the chip before we can see details under the metal. I'm a college student starting a wordpress blog that showcases high-resolution images for digital printing. I was wondering if you would mind if I wrote a post that highlights the wonderful images you've produced. I plan to support my site by integrating fotomoto for people to buy digital prints of the images I link to (mostly public-domain) I ask because I see your images are copyrighted and wish to respect your rights as creators. I also would be happy to link to the images but turn off the fotomoto integration so as not to sell prints of your work. My site is www.big4print.com and I can be contacted through the suggest tab on the site. Thanks!